The Fox 40 Pealess Whistle is much like a harmonically-tuned instrument, because it produces three slightly different frequencies simultaneously. The different frequencies are superimposed on one another out of phase, and thus alternately reinforce and cancel out each other. The result is a loud, piercing vibrato that has no moving parts to get stuck. The whistle is a plastic-molded injection process that is ultrasonically welded together, rather than glued. Fox 40 whistles are great for men, women, and kids. Our customers use them for a variety of purposes including dog training to stop dogs from barking, referee and coaches use them for sporting events, hikers and campers use them for emergency and survival purposes, homeowners use them to scare unwanted animals away, boaters and lifeguards use them for safety and rescue purposes, police and crossing guards use them to direct traffic, and the list goes on. Stand out amongst the crowd. 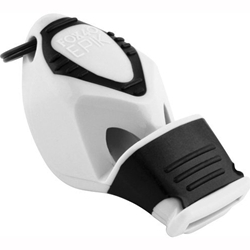 The Fox 40 Epik whistle is extremely loud and easy to blow. Sound power: 120 dB. Proudly made in North America. The EPIK has an integrated black molded cushioned mouth group and integrated ribs along the top surface of whistle to provide for several holding options> Its ergonic shape fits to your hand.